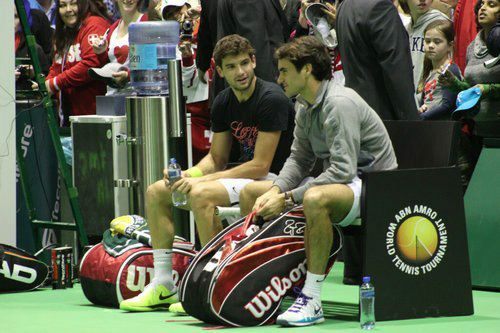 Roger Federer practiced with Grigor Dimitrov earlier today, the young 21 year old from Bulgaria. Many comparisons have been drawn between the two players, beginning with their similar styles on court. While Dimitrov has yet to win a title, he has made progress in coming up the rankings, reaching the final in Brisbane earlier this year before falling to Andy Murray. The two players had a practice session at the Rotterdam ABN AMRO World Tennis Tournament. See the practice video below. Those hopeful for a meeting between the Swiss maestro and “Showtime Dimitrov” will have to wait for another tournament. I am also a fan of Grigor Dimitrov and his game. If it catches on, the nickname “Dima” started here.